What Does ‘Baal Shem Tov’ Mean? I was reading up about Rabbi Yisrael Baal Shem Tov, the founder of the Chassidic movement. It seems there were other rabbis called “Baal Shem.” But he was the only one called “Baal Shem Tov.” What is the distinction, and what does it even mean? Let’s start with the basic term baal shem. It literally means “master of the Name.” It is a title often given to those who have mastered the kabbalistic names of G‑d and His angels. Through intense concentration on these names, they are capable of overriding the patterns of nature to heal the sick and rescue those in need. And indeed, he certainly cannot be compared to those baal shems. They were principally miracle workers, of which the Jewish people have had plenty. The Baal Shem Tov revealed a path of serving G‑d with love and joy that revolutionized our understanding and practice of Judaism to this day. Besides, the Baal Shem Tov had no need to manipulate divine names in order to override nature.2 He was a person entirely beyond nature even while living inside it. True, tradition tells us that the Baal Shem Tov was the successor of a string of baal shems. Orphaned as an infant, he was adopted as a child by a group of hidden tzadikim (righteous men), who taught him Torah, including the mystical tradition. Eventually, Rabbi Yisrael Baal Shem Tov himself became the group's leader. This would explain why he was known as Baal Shem, but it does not explain the added appellation of Tov. Thus, a baal shem tov is one who has a good reputation. Rabbi Dovber goes on to explain that when we talk about divine names, there are two levels. This is somewhat similar to the names we give people. We might call a person “Officer” or “Doctor” or “Sir” or “Professor.” These are all descriptive names. They refer to some particular quality about the individual. Indeed, they may all be titles of the same person. But then we each have a name that doesn’t describe us at all, but it’s our name. When someone calls you by this name, they’re not referring to you in any particular role or describing you in any way. They’re calling you. The essential you. So, too, with G‑d. There are many different names that refer to G‑d as He relates to His world in some particular modality. Some refer to Him as kind, others as merciful, others as judging or forgiving. But then there is a name that does not refer to Him in any particular modality or relationship to anything. It refers only to Him as He is, that which cannot be described, because there is no description. Some names have multiple meanings, depending on their context. For example, when we refer to G‑d with the spelled י–ה–ו–ה, we might be referring to Him as One who is מהוה—who brings all things into being at every moment, and therefore cares for each one. Or we could mean that He “is, was and will be,” and therefore transcends all of existence. But this name is also called “the essential name.”8 In that sense, it is not a description of anything at all about G‑d—it just refers to Him as He is, and can never be known. When G‑d created the world, the first creation was light. “And He saw the light, that it was good.” What was so good about it? That it was a light that would not diminish, that nothing could conceal. It was the light that is the quintessence of all things, the true goodness found even in the thickest darkness. Being “master of the good name,” then, means that the Baal Shem Tov was able to perceive that essential good, hidden light within everything. This was his central task, for which his soul came to this world—to teach us how to discover that light, that essential goodness, within each person, each thing and each event, and reveal that to the entire world. It was after much pressure from his teachers that on 18 Elul 1734 (his 36th birthday) Rabbi Yisrael Baal Shem Tov finally started teaching and revealing his greatness publicly. This ushered in a new era in Jewish life. According to the Chassidic thought, the simple blessing of the unlettered Jew was as holy as advanced Torah study. Purity of intent was valued over dry achievement, joy and humility were to be admired, and even the simplest peasant could serve G‑d through passionate prayer. Jews from far and wide flocked to hear the Baal Shem Tov's holy words and to observe him consumed in prayer. It was revealed to the Baal Shem Tov that this new path was meant to prepare the world for the messianic era. This, it is explained, is another reason why he went by the name Baal Shem Tov. The “crown of a good name” (which, as we quoted from the Mishnah earlier, rises above the three crowns of Torah, priesthood and sovereignty) is an allusion to Moshiach, when the essence-light of the first day of creation will shine throughout the world. Thus, Rabbi Yisrael was called the Baal Shem Tov, for his mission was to prepare the world for the messianic era.10 May it be speedily in our days! Rabbi Eliyahu Baal Shem Luentz served as rabbi of Worms, where he passed away. Some however claim that there may have been a third Rabbi Eliyahu Baal Shem who lived in Worms at the same time, but this is beyond the scope of this article. See Torat Shalom, p. 46. See, for example, Sefer HaSichot 5701, 18 Elul. Ethics of the Fathers 4:13. Many say that the Baal Shem Tov was called such because he knew how to manipulate Divine names. But in truth, this is not so. King David said, “A righteous person rules with awe of G‑d” (II Samuel 23:3). The rabbis of the Talmud explained: G‑d decrees and the righteous annul His decree. This then is the reason he was called the Baal Shem Tov—because he annulled many harsh decrees that came forth from G‑d upon every Jewish person (Yeshuot Yisrael 2:10). In other words, he was called the Baal Shem Tov because he “overruled” G‑d. 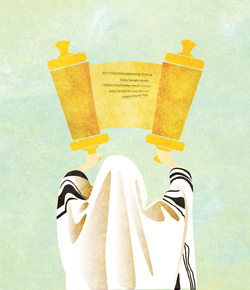 He was the master, so to speak, when it came to G‑d’s decrees, transforming them into good. Imagine a father teaching his son some halachah, or novel idea of his in Torah. Now imagine the son, with his great acuity and skill, refuting his father’s words and providing a different way of understanding the matter. Now, although the son has opposed his father’s opinion and rejected his words, nevertheless, the father has great pleasure and tremendous joy from this, as it says “Be wise, my son, and rejoice my heart!” (Proverbs 23:15). Indeed, the father desires this much more than that his son should sit quietly and agree with all he has to say (Ohr Torah 89). So too, the tzadik overrules G‑d, so to speak. The Maggid goes on to explain that this is what is meant when we say that tzadikim “do G‑d’s will.” Not His word, or His decree, but His will. Because it is His will that the righteous arouse G‑d’s compassion, so that all harsh decrees be nullified—just as it is the father’s will that his son should learn well enough to outsmart him. In other words, a tzadik is capable of reaching deeper, beyond the open manifestations of G‑d, His judgments and His decrees, into His inner will. There, deep within, there is only good. Furthermore, as we said, while the Baal Shem Tov certainly averted many harsh divine decrees, this was not his principal legacy. And it is that legacy that you would expect his name to reflect. Rabbi Reuven, the Baal Shem of Lyozhna, lived around the time of Rabbi Schneur Zalman of Liadi, and was known as a miracle worker (see Sefer HaSichot 5696, p. 321). See Kesef Mishnah on Maimonides, Mishneh Torah, Laws of Idolatry, ch. 2, halachah 7. Rabbi Moshe Cordovero, Pardes Rimonim, Portal 19. Maimonides, Moreh Nevuchim, part I, ch. 61. Joseph Albo, Sefer Ha’Ikrim, Maamar 2, ch. 28. Torat Shalom, pp. 45–46; Keter Shem Tov (Kehot) 318. See also Sefer HaSichot 5705, p. 92 (quoted in Keter Shem Tov cited above), where it is explained that “good” refers to the level of Atik. See also Sefer HaSichot, Summer 5700, p. 170: The Baal Shem Tov was the “master of the good name” for he was able to bring good for the Jewish nation, and lift the Jewish people up to that good. Sefer HaMaamarim 5663, vol. 1, p. 143. Why Do Many Chassidim Wear Shtreimels (Fur Hats)? What Is Rashi Script and Where Did It Come From? Why Is Impurity Not Observed? Why Say Shema at Bedtime?